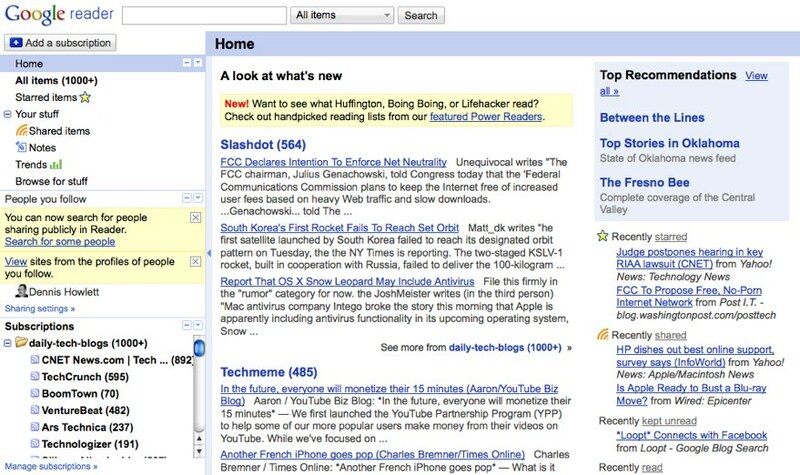 Once a big advocate for Google Reader, I have to admit that I haven’t logged in in weeks, maybe months. That’s not to say I’m not reading. Sometimes I feel like reading - and writing this blog - are the only things I do. But my sources of for reading material are scattered across the Web, not in one aggregated spot. I catch headlines on Yahoo News and Google News. I have a pretty extensive lineup of browser bookmarks to take me to sites that I scan throughout the day. Techmeme is always in one of my browser tabs so I can keep a pulse on what others in my industry are talking about. And then there are Twitter and Facebook. I actually pick up a lot of interesting reading material from people I’m following on Twitter and some friends on Facebook, with some of it becoming fodder for blog posts here. The truth of the matter is that RSS readers are a Web 1.0 tool, an aggregator of news headlines that never really caught on with the mainstream the way Twitter and Facebook have. Dave Winer was right about River of News style aggregators. A user interface where I see a stream of news and can click on the bits that interest me without doing a lot of management is superior to the using the current dominant RSS reader paradigm where I need to click on multiple folders, manage read/unread state and wade through massive walls of text I don’t want to read to get to the gems. Today’s RSS readers are a one way tool instead of a two-way tool. One of the things I like about shared links in Twitter & Facebook is that I can start or read a conversation about the story and otherwise give feedback (i.e. “like” or retweet) to the publisher of the news as part of the experience. This is where I think Sam’s comment that these are “Web 1.0” tools rings the truest. Google Reader recently added a “like” feature but it is broken in that the information about who liked one of my posts never gets back to me whereas it does when I share this post on Twitter or Facebook. As Dave McClure once ranted, it's all about the faces. The user interface of RSS readers is sterile and impersonal compared to social sites like Twitter and Facebook because of the lack of pictures/faces of the people whose words you are reading. It always makes a difference to me when I read a blog and there is a picture of the author and the same goes for just browsing a Twitter account. No good ways to separate the wheat from the chaff. As if it isn’t bad enough that you are nagged about having thousands of unread blog posts when you don’t visit your RSS reader for a few days, there isn’t a good way to get an overview of what is most interesting/pressing and then move on by marking everything as read. On the other hand, when I go to Techmeme I can always see what the current top stories are and can even go back to see what was popular on the days I didn’t visit the site. The process of adding feeds still takes too many steps. If I see your Twitter profile and think you’re worth following, I click the “follow” button and I’m done. On the other hand, if I visit your blog there’s a multi-step process involved to adding you to my subscriptions even if I use a web-based RSS aggregator like Google Reader. These are the five biggest bugs in the traditional RSS reading experience today that I hope eventually get fixed since it is holding back the benefits people can get from reading blogs and/other activity streams using the open & standard infrastructure of the Web.